Recognizing clinical deterioration in patients outside the intensive care unit may be challenging. Lower nursing to patient ratios, less frequent vital sign assessment, and more ambulatory patient populations on the general wards as compared to the intensive care unit have all been cited as possible challenges to overcome. Dr Bradford Winters examines the evolving role of early warning systems. He also explores the emerging role of wireless technologies for continuous “surveillance” monitoring of ambulatory patients and discusses the potential for these new systems to improve patient safety and outcomes. Clinical deterioration on the general hospital wards is common and all too often results in patients progressing to cardiopulmonary arrest, which carries significant morbidity and mortality.1-5 Occasionally, this progression is not witnessed or perhaps even worse, observed but unrecognized,1,6 resulting in an unmonitored/unwitnessed arrest. These events are currently categorized as a serious adverse event (AE) by several reporting metrics including the American Heart Association’s Get with the Guidelines®7 and the Agency for Healthcare Research and Quality’s (AHRQ) Patient Safety Indicators (PSIs).8 Surgical patients may be prone to cardiopulmonary arrest due to their underlying diseases (especially conditions such as obstructive sleep apnea and cardiac disease), the surgical procedure, and the administration of opioids coupled with residual anesthesia.9,10 This is a major concern for anesthesia professionals who help determine if the patient is safe to go to an unmonitored floor or should request a monitored bed which may be a limited resource. In the mid-1990s, Rapid Response Systems (RRS) were implemented to address this patient safety problem.4,11,12 RRSs are composed of two main elements. The most visible element is the team that responds to the call for help for the deteriorating patient. These teams are often, though not always, made up of intensive care unit providers and are referred to as the “efferent limb” of the response. The “afferent limb” refers to the process and criteria by which clinical deterioration is recognized and a rapid response team is activated. The afferent limb uses activation criteria, education programs, and policy changes to encourage providers to activate the efferent limb whenever a patient’s condition appears to be deteriorating. Understanding and developing effective and valid activation criteria is perhaps the most crucial component of the RRS2, even though the rapid response team (efferent limb) is essential to the success of these systems. Therefore, these activation criteria have evolved over time into a wide range of Early Warning Scores (EWS). Beginning in the early 1990s, common predictors of clinical deterioration were identified from the medical records of patients that had arrested on the general ward.2,5,6 The predictors identified were primarily physiological changes (elevated heart rate, low blood pressure, or mental status change) and were often found to be present for many hours prior to the arrest event. The ability to identify these changes indicated potential opportunities for early intervention. Presumably, the earlier warning signs are recognized, the more effective the intervention could be. Even though RRS have been successful in reducing in-hospital mortality and unanticipated cardiopulmonary arrest, they have failed to achieve their full potential.4,9,10 Failure of health care professionals to recognize the deteriorating patient and the inability of existing data systems to trigger an appropriate response in a timely manner remain pervasive. Efforts to address deficiencies in early identification of clinical deterioration (i.e., afferent limb failure) have taken several approaches including education programs, nurse empowerment initiatives, and increasingly the use of data-driven systems to improve clinical response. Initially, hospitals used single vital sign parameter thresholds in combination with “clinical concern” about the patient by the bedside nursing staff as activation criteria and many still do. Many hospitals subsequently developed and implemented “early warning scores” (EWSs) that attempt to integrate vital signs and laboratory data (e.g., lactic acid) to improve the sensitivity and specificity for earlier detection. Some studies of EWSs have shown improvement in patient outcomes compared with single parameter vital signs systems while others have shown little difference in outcomes.3,13-36 These differences in study findings may result from use of overly strict or loose criteria for signaling a deterioration (e.g., extreme heart-rate cutoffs), use of nonequivalent outcomes (such as total cardiac arrest rate vs. non-ICU cardiac arrest rate), ineffective education programs to encourage appropriate RRS activation, lack of policies to support the intervention, poor project implementation, and variable acceptance in the medical care culture, among others. A number of EWSs are worth focusing on. One of the earliest published in the literature was by Subbe et al. in 2003.13 This group developed a manual multiparameter scoring system, which assigned points based on the degree of abnormality of each parameter. Their EWS included mental status in addition to physiologic vital signs. When patients exceeded a threshold score (> 4), they were referred for clinical evaluation. Unfortunately, its initial implementation did not show an improvement in outcomes. In 2006, Green and Williams reported the results of an “Early Warning Clinical Marker Referral Tool,” which incorporated single parameter vital signs. While the authors were unable to demonstrate improved outcomes with the EWS, it did result in patients being referred for ICU admission with fewer markers of instability and illness suggesting that such a score could lead to earlier recognition of deterioration. In another study, Rothschild et al.18 implemented a single parameter EWS for patients on general medical wards. They found that while early warning conditions used to activate RRS teams were only fair predictors of acute deterioration, early signs of respiratory failure during routine monitoring were strongly associated with future life-threatening adverse events. In that same year, Prytherch et al. described an EWS called ViEWS (VitalPAC™ EWS, Sussex Place, London).17 This data-aggregated and weighted “track and trigger” system was developed to potentially become a national standard in the United Kingdom’s National Health Service. 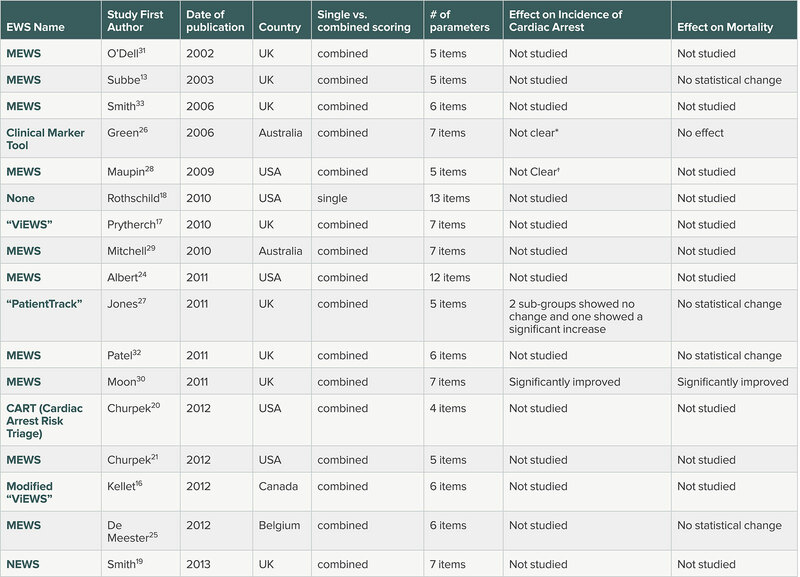 When ViEWS was applied to previously collected datasets, its ability to predict cardiac arrest and death was superior to other existing EWSs.17,19 A simplified version of ViEWS was then validated in a Canadian regional hospital on actual patients where it was found to be effective for general ward medical and surgical patients.16 Table 1 includes a list of several clinically evaluated EWSs. EWSs reported in Systematic Review by Smith et al.36 MEWS—Modified Early Warning Scores. NEWS—UK national EWS. All multiple parameter MEWS used heart rate, blood pressure and respiratory rate. Most also used temperature and one half used oxygen saturation. (*) showed a statistically significant reduction in incidence of arrest events but did not provide denominator data to calculate rates. (†) showed a reduction from 0.77 to .39/1000 patient days but did not provide statistics. A 2014 systematic review of the EWS literature for use on general ward patients included 1 randomized controlled trial and 20 observational studies that evaluated 13 different EWS systems. Some EWSs used in the studies consisted of single parameters systems while others used integrated scoring systems. Some sought to identify specific clinical conditions such as sepsis. Eight studies (all observational) examined the ability of an EWS to predict death or cardiopulmonary arrest. Collectively, these studies showed that EWSs perform well for prediction of cardiac arrest and death within 48 hours. Thirteen studies examined the impact of EWS on health outcomes and resource utilization with mixed results.37 This suggests that EWSs’ impact on outcome is uncertain, but they may be able to identify deteriorating patients. More recently, predictive algorithms using machine learning and big data have been proposed and developed, with improved ability to predict clinical deterioration.38 Machine learning is an artificial intelligence process whereby computer algorithms “self-learn” and improve their performance through training on datasets without the need for reprogramming. While conceptually appealing, EWSs need to demonstrate that their implementation can improve clinical outcomes. Several explanations have been proposed to explain the failure of existing EWSs in improving clinical outcomes. First, the frequency of vital sign acquisition on the wards may be insufficient to allow detection of clinical deterioration.6 A second possible explanation is that vital sign values may have inaccuracies and audits of vital sign data confirm this.39 Electronic health records (EHRs) do little to improve this situation as their performance is dependent on the intermittently and sometimes inaccurately collected data points. Third, recognition, response, and communication to the clinical team may not be timely enough. Therefore, it is not surprising that EWSs and the afferent limb of RRS don’t necessarily live up to their presumed potential. Surveillance monitoring may be a better way to collect and act on clinical data for a patient who is deteriorating on a general ward.40,41 Surveillance monitoring is distinguished from “condition monitoring,” which is employed in ICUs where the patients are unstable or are at risk for instability and the staff-to-patient ratio is adjusted accordingly. In contrast, general ward patients are generally at low risk for instability and the staff-to-patient ratio is much lower. Surveillance monitoring seeks to identify the infrequent occurrence of clinical deterioration in otherwise low-risk patients. General medical patients and especially postsurgical patients on the wards are at risk of a variety of complications including arrhythmias, myocardial ischemia, sepsis, respiratory insufficiency, and bleeding complications. Surveillance monitoring offers the possibility of improving upon many of the limiting features of existing EWSs that are thought to be at the core of afferent limb failure; it is continuous, relies less on fallible humans, is potentially more accurate,and, if automatically linked to an activation hierarchy such as a pager or mobile phone escalation protocol, may be able to circumvent the continued lack of appreciation of the patient’s developing deterioration. Surveillance monitoring still needs to overcome several hurdles that may be challenging. First, it needs to be mobile and wireless since general ward patients are usually ambulatory as compared to monitoring of ICU patients, who are much less so. Wireless technology has advanced tremendously in the last decade, and wireless systems now exist that may meet this need.42 Embedded in the use of this technology is the need to meet ever-changing and more stringent security standards to protect not only patients’ information, but also hospitals’ health information technology systems. A second requirement is the need for the mobile surveillance monitor to have adequate battery life. The need for frequent battery changes/recharges would make such a system impractical. A third requirement is the need for the monitor to be comfortable and relatively unobtrusive. Ambulatory general ward patients will not likely tolerate wearing heavy or uncomfortable monitoring equipment. Fourth, the vital-sign data collection should be continuous, since use of intermittently collected data may miss early signs of deterioration. Fifth, it needs to have an acceptable accuracy and a manageable false alarm rate. Condition monitoring in the ICU (e.g., certain ECG alarms) has a high false alarm rate. These high false alarm rates may lead to alarm fatigue, which is a widely recognized patient safety issue in which alarms are ignored or there is a delayed response.43 An acceptable false alarm rate for clinical monitoring of ward patients is uncertain. However, the need to control alarm fatigue must be balanced against the potential benefit that may be derived by obtaining continuous higher fidelity data. Unrecognized and unattended clinical deterioration on general hospital wards must be avoided. The implementation of RRSs has reduced the occurrence of such events but better methods to predict early deterioration and to link this to interventions are needed to further improve outcomes. Despite improvements in EWS and surveillance monitoring, it will still be necessary for providers to act in a timely manner, develop an appropriate differential diagnosis quickly, gather additional relevant data as needed, and institute effective evidence-based therapies including necessary triage to a higher level of care to improve patient outcomes. Dr. Winters is the division director for Critical Care Medicine in the Johns Hopkins Dept. of Anesthesiology and Critical Care Medicine and co-director of the Surgical Intensive Care Units at the Johns Hopkins University School of Medicine. He reports no conflicts of interest pertaining to this article. Smith AF, Wood J. 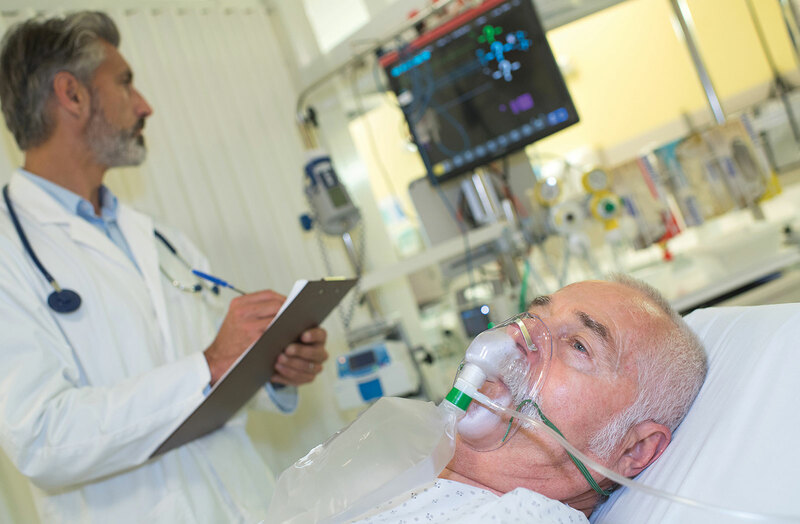 Can some in-hospital cardio-respiratory arrests be prevented? A prospective survey. Resuscitation 1998;37:133–137. Devita MA, Smith GB, Adam SK, et al. Identifying the hospitalized patient in crisis—a consensus conference on the afferent limb of the Rapid Response Systems. Resuscitation 2010;81:375–382. Bellomo, R Ackerman M, Bailey M, et al. A controlled trial of electronic automated vital signs monitoring in general hospital wards. Crit Care Med 2012;40: 2349–2361. Winters BD, Weaver SJ, Pfoh ER, et al. Rapid response systems as a patient safety strategy: a systematic review. Ann Int Med 2013;158:417–425. Herlitz JA, Bang A, Aune S, et al. Characteristics and outcome among patients suffering in-hospital cardiac arrest in monitored and non-monitored areas. Resuscitation 2001; 48:125–135. Buist MD, Jarmolowski E, Burton PR, et al. Recognising clinical instability in hospital patients before cardiac arrest or unplanned admission to intensive care. A pilot study in a tertiary-care hospital. Med J Aust 1999; 171:22–5. Fox N, Willcutt R, Elberfeld A, Porter J, Mazzarelli AJ. A critical review of patient safety indicators attributed to trauma surgeons. Injury 2017;48:1994-1998. Goldhill DR. Preventing surgical deaths: critical care and intensive care outreach services in the postoperative period. Br J Anaesth 2005;95:88–94. Lee A, Lum ME, O’Regan WJ, Hillman KM. Early post-operative emergencies requiring an intensive care team intervention. Anaesthesia 1998;53:529–535. Maharaj R, Raffaele I, Wendon J. Rapid Response Systems: a systematic review and meta-analysis. Crit Care 2015;19:254–268. Ranji SR, Auerbach AD, Hurd CJ, O’Rourke K, Shojana KG. Effects of rapid response systems on clinical outcomes: systematic review and meta-analysis. J Hosp Med 2007;2:422–432. Subbe CP, Davies RG, Williams E, Rutherford P, Gemmell L. Effect of introducing the Modified Early Warning score on clinical outcomes, cardio-pulmonary arrests and intensive care utilisation in acute medical admissions. Anaesthesia 2003;58:775–803. Subbe CP, Gao H, Harrison DA. Reproducibility of physiological track and trigger warning systems for identifying at-risk patients on the ward. Intensive Care Med 2007;33:619–24. Gardner-Thorpe J, Love N, Wrightson J, Walsh S, Keeling N. The value of Modified Early Warning Score (MEWS) in surgical patients: a prospective observational study. Ann R Coll Surg Engl 2006;88:571–5. Kellett J, Kim A. Validation of an abbreviated VitalPAC™ early warning score (ViEWS) in 75,419 consecutive admissions to a Canadian regional hospital. Resuscitation 2012;83:297–302. Prytherch DR, Smith GB, Schmidt PE, Featherstone PI. ViEWS—towards a national early warning score for detecting adult inpatient deterioration. Resuscitation 2010;81:932–937. Smith GB, Prytherch DR, Meredith P, Schmidt PE, Featherstone PI. The ability of the national early warning score (NEWS) to discriminate patients at risk of early cardiac arrest, unanticipated intensive care unit admission, and death. Resuscitation 2013;84:465–470. Churpek MM, Yuen TC, Park SY, et al. Derivation of a cardiac arrest prediction model using ward vital signs. Crit Care Med 2012;40:2102–2108. Churpek MM, Yuen TC, Huber MT, et al. Predicting cardiac arrest on the wards: a nested case-control study. Chest 2012;141:1170–1176. Opio MO, Nansubuga G, Kellett J. Validation of the VitalPAC™ early warning score (ViEWS) in acutely ill medical patients attending a resource-poor hospital in sub-Saharan Africa. Resuscitation 2013;84:743–746. Bailey TC, Chen Y, Mao Y, et al. A trial of a real-time alert for clinical deterioration in patients hospitalized on general medical wards. J Hosp Med 2013;8:236–242. Albert BL, Huesman L. Development of a modified early warning score using the electronic medical record. Dimens Crit Care Nurs 2011;30:283–292. De Meester K, Das T, Hellemans K, et al. Impact of a standardized nurse observation protocol including MEWS after intensive care unit discharge. Resuscitation 2013;84:184–188. Green AL, Williams A. An evaluation of an early warning clinical marker referral tool. Intensive Crit Care Nurs 2006;22:274–282. Jones S, Mullally M, Ingleby S, et al. Bedside electronic capture of clinical observations and automated clinical alerts to improve compliance with an early warning score protocol. Crit Care Resusc 2011;3:83–88. Maupin JM, Roth DJ, Krapes JM. Use of the modified early warning score decreases code blue events. Jt Comm J Qual Patient Saf 2009;35:598–603. Mitchell IA, McKay H, Van Leuvan C, et al. A prospective controlled trial of the effect of a multi-faceted intervention on early recognition and intervention in deteriorating hospital patients. Resuscitation 2010;81:658–666. Moon A, Cosgrove JF, Lea D, Fairs A, Cressey DM. An eight-year audit before and after the introduction of modified early warning score (MEWS) charts, of patients admitted to a tertiary referral intensive care unit after CPR. Resuscitation 2011;82:150–154. Odell M, Forster A, Rudman K, Bass F. The critical care outreach service and the early warning system on surgical wards. Nurs Crit Care 2002;7:132–135. Patel MS, Jones MA, Jiggins M, Williams SC. Does the use of a “track and trigger” warning system reduce mortality in trauma patients? Injury 2011;42:1455–1459. Smith AF, Oakey RJ. Incidence and significance of errors in a patient “track and trigger” system during an epidemic of Legionnaires’ disease: retrospective case note analysis. Anaesthesia 2006;61:222–228. Subbe CP, Davies RG, Williams E, Rutherford P, Gemmell L. Effect of introducing the modified early warning score on clinical outcomes, cardio-pulmonary arrests and intensive care utilisation in acute medical admissions. Anaesthesia 2003;58:797–802. Hammond NE, Spooner AJ, Barnett AG, et al. The effect of implementing a Modified Early Warning Scoring (MEWS) system on the adequacy of vital sign documentation. Aust Crit Care 2013;26:18–22. Cretikos M, Chen J, Hillman K, et al. MERIT study investigators. The objective medical emergency team activation criteria: a case-control study. Resuscitation 2007;73:62–72. Smith MEB, Chiovaro JC, O’Neil M et al. Early warning system scores for clinical deterioration in hospitalized patients: a systematic review. Ann Am Thorac Soc 2014;11:1454–1465. Henry KE, Hager DN, Pronovost PJ, Saria S. A targeted real-time early warning score (TREWScore) for Septic Shock. Sci Transl Med 2015;7:299–308. Chen J, Hillman K, Bellomo R, et al. The impact of introducing a medical emergency team system on the documentation of vital signs. Resuscitation 2009; 80:35–43. Taenzer AH, Pyke JP, McGrath SP. A review of current and emerging approaches to address failure-to-rescue. Anesthesiology 2011;115:421–31. Taenzer AH, Spence BC. The afferent limb of rapid response teams: Continuous monitoring on general care units. Crit Care Clin 2018;34:189–98. Winters BD, Cvach M, Bonafide CP, et al. Technological Distractions (Part2): A summary of approaches to manage alarm quantity with intent to reduce alarm fatigue. Crit Care Med 2018;46:130–137. McGrath SP, Pyke J, Taenzer AH. Assessment of continuous acoustic respiratory rate monitoring as an addition to a pulse oximetry-based patient surveillance system. J Clin Monit Comput 2017;31:561–569. McGrath SP, Taenzer AH, Karon N, Blike G. Surveillance monitoring management for general care units: strategy, design, and implementation. Jt Comm J Qual Patient Saf 2016;42:293–302. Taenzer AH, Pyke J, Herrick MD, Dodds TM, McGrath SP. A comparison of oxygen saturation data in inpatients with low oxygen saturation using automated continuous monitoring and intermittent manual data charting. Anesth Analg 2014;118:326–31. Pyke J, Taenzer AH, Renaud CE, McGrath SP. Developing a continuous monitoring infrastructure for detection of inpatient deterioration. Jt Comm J Qual Patient Saf 2012;38:428–31. Taenzer AH, Pyke JB, McGrath SP, Blike GT. Impact of pulse oximetry surveillance on rescue events and intensive care unit transfers: a before and after concurrence study Anesthesiology 2010;112:282–7. Watkinson PJ, Barber VS, Price JD, et al. A randomized controlled trial of the effect of continuous electronic physiological monitoring on the adverse event rate in high risk medical and surgical patients. Anaesthesia 2006;61:1031–9.